Only 1 day until the lab-wide party! 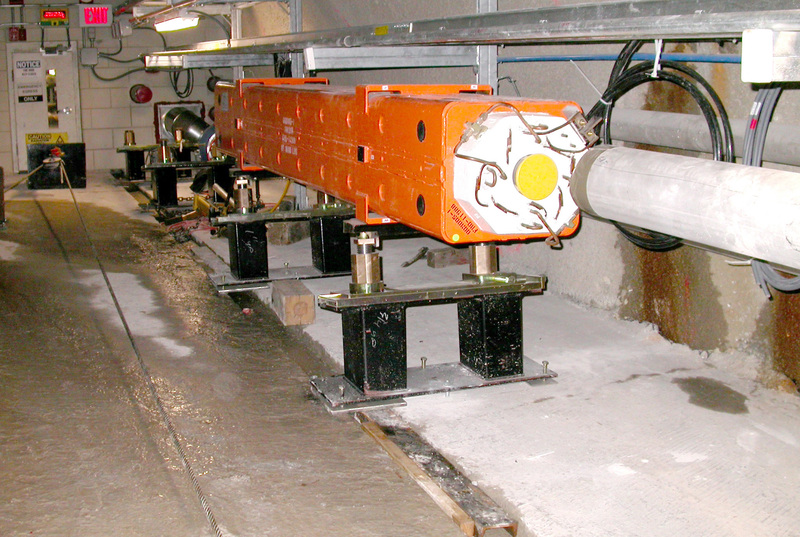 On Tuesday, November 18, NuMI's Deputy Installation Manager, Rick Ford, announced the safe and successful installation of the first NuMI quadrupole magnet in the pre-target tunnel. 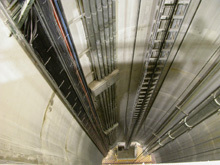 "The magnet was lowered down the approximately 150 foot deep target hall shaft and pulled up the 15 percent tunnel slope on a specially designed installation cart using a winch and pulley system," said Ford. "There is a braking system which prevents the magnet and cart from rolling down the wet tunnel floor if the cable releases or breaks for any reason." Mayling Wong, of the Particle Physics Division, did the engineering for the cart and magnet installation, and Mike Mascione, also of the Particle Physics Division, served as task manager for the rigging company. Surprise! Our little corner of the universe is even smaller than we thought. Since the days of Galileo's telescope, new and better scientific instruments have steadily transformed our conception of the universe. Now we've got the Wilkinson Microwave Anisotropy Probe. This superb gizmo, launched in June 2001, is floating 1 million miles from Earth in the second Lagrange Point, measuring the density of the universe with unheard-of digital accuracy and sending data back to mission control. Already, the probe's findings have provided a few salient new notions about the nature of cosmic reality. For starters, the universe is 13.7 billion years old. Unlike previous figures, this is not a rough estimate; the margin of error is about 1 percent. In addition, the universe is flat. Forget all that mind-boggling space-time-is-curved stuff. Euclid was right all along. And the space-time pancake will expand infinitely. There's no such thing as an end to this particular universe. 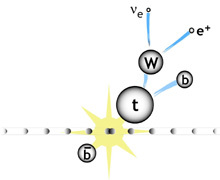 A simplified picture of a single top event, in which a top quark and an anti-bottom quark are produced in a proton-antiproton collision. A particular top quark decay mode is also depicted. represents a background to intermediate-mass (110 to 150 GeV/c2) Higgs boson events and therefore it will be important to isolate this background. times larger than predicted, but the measurement uncertainty precludes claiming evidence of this process. Work is in progress to analyze the larger Run II CDF datasets accumulated since March 2001, which will allow experimenters to verify if statistical fluctuations or other factors are responsible for the excess measured in Run I data. Pushpa Bhat, FNAL, will speak at UTeV tonight at 6:30 p.m. in One West. The topic, "Advanced Multivariate Methods for your Data Analysis," will focus on multidimensional analysis methods from Grid Search to Neural Networks in a variety of approaches and applications. Free dinner will be served at 6:00 p.m.
Keep moving--don't make meals the only focal point of your holiday. Plan a special hike with the family; even just a walk around the block after dinner can help you connect and get away from the food. Tickets are still available for Friday night's lecture, "Hadron Therapy and Cancer Treatment," presented by Dr. Arlene Lennox, Medical Physicist, Fermilab.